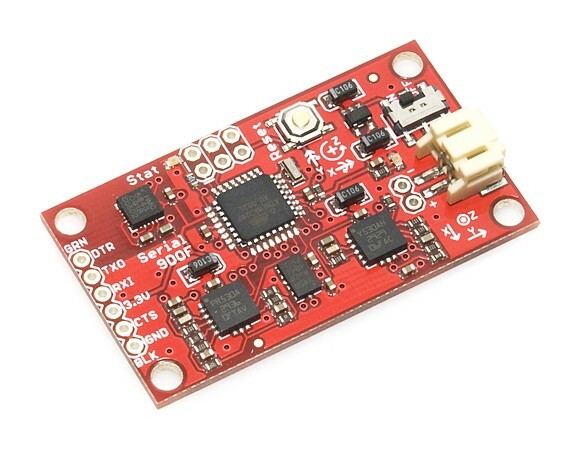 The 9DOF Razor IMU incorporates four sensors - an LY530AL (single-axis gyro), LPR530AL (dual-axis gyro), ADXL345 (triple-axis accelerometer), and HMC5843 (triple-axis magnetometer) - to give you nine degrees of inertial measurement. The outputs of all sensors are processed by an on-board ATmega328 and output over a serial interface. With the work of Jordi Munoz and many others, the 9DOF Razor can become an Attitude and Heading Reference System. This enables the 9DOF Razor to become a very powerful control mechanism for UAVs, autonomous vehicles and image stabilization systems. The board comes programmed with the 8MHz Arduino bootloader and example firmware that tests the outputs of all the sensors. Simply connect to the serial TX and RX pins with a 3.3V FTDI Basic Breakout, open a terminal program to 38400bps and a menu will guide you through testing the sensors. You can use the Arduino IDE to program your code onto the 9DOF, just select the 'Arduino Pro or Pro Mini (3.3v, 8mhz) w/ATmega328 as your board. The 9DOF operates at 3.3VDC; any power supplied to the white JST connector will be regulated down to this operating voltage - our LiPo batteries are an excellent power supply choice. The output header is designed to mate with our 3.3V FTDI Basic Breakout board, so you can easily connect the board to a computer's USB port. Or, for a wireless solution, it can be connected to the Bluetooth Mate or an XBee Explorer. Get 9 Degrees of Freedom - Razor IMU from DFRobot Store or DFRobot Distributor.